I've been using these exclusively for a couple of years and have even raced with them. My wife prefers them as well -- the adjustable length makes it practical for one strap to fit a variety of shoe sizes. These are made out of sheet neoprene -- it flexes with the foot, can be cut to any length, holds its position on the heel, is quickly adjustable for length, is durable and has good strength. It is commonly available through gasket suppliers. 1. The material is cut on a bias to accommodate the length of the strap. I use 20" finished length for up to size 11 (US) shoe. 2. Slot intervals are 1.5" on the inboard side and 1" on the outboard side. The more slots, the more adjustable the strap. 3. These straps are cut 1.5" wide, trimmed down to 1 1/8" width plus 3/8" for the heel cup. As an alternative, the straps can be cut straight without heel cups. 4. Get enough material to practice on, make mistakes on and make an extra pair or two. I used 1/8" sheet neoprene. 1. Lay-out the desired length and width using a white (pencil or comparable). 2. Cut the gross strap size with a straight edge and box knife. 3. Trim to create heel cup (optional). 5. Make jig for slots as shown above using Hobie toe strap for slot template, centered on strap and angled at about 20 degrees. 5. Use a leather punch to create appropriate size hole at each end of slot; use box knife to remove remaining material. Trial fit each slot on pedal tab; adjust as necessary. Note that the angle on the slot allows it to: 1) to clear the pedal shaft and 2) allow the heel to drop straight in without slipping off (like the raised back of a sandal). Note also, the pedal now hangs correctly without the need for counterbalancing weights or bungees. Note, heel and toe straps should not be used together, as they can trap the foot in case of capsize. 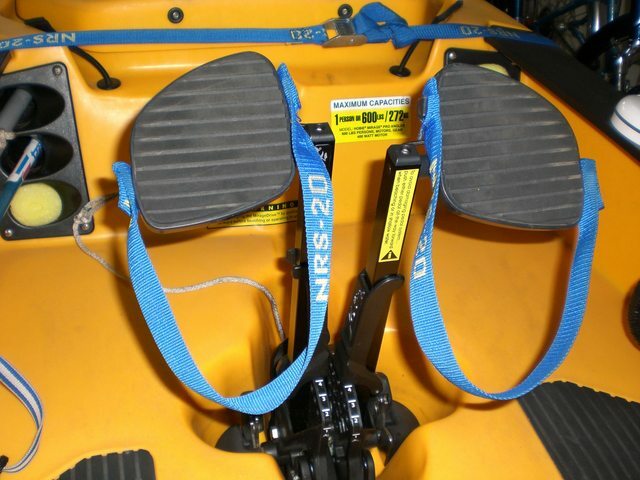 Heel straps are a great alternative to the factory toe straps for many users. I've only pedalled a Hobie once, for a few hours in a hired boat, but I found it quite a strain holding my legs up in that horizontal position. Maybe more careful adjustment of seat and pedal positions would have helped, but I came off that trip knowing that, if/when I buy my own Hobie, heel straps will be the first mod on my list. I wonder if people who use recumbent bicycles have similar issues. Thanks for the detailed how-to, Roadrunner. Perfect! - Under construction! Thanks RR. I've had my Adventure for over a year. I've never felt the need for heel straps. I think it all depends on the soles of the footwear used. I think this is a great idea! I need to find a source of sheet neoprene or strap in Canada! My size 13's With Keen sandals on do not fit the toe straps and have been off since day one! I need to find a source of sheet neoprene or strap in Canada! Try a gasket supply shop. 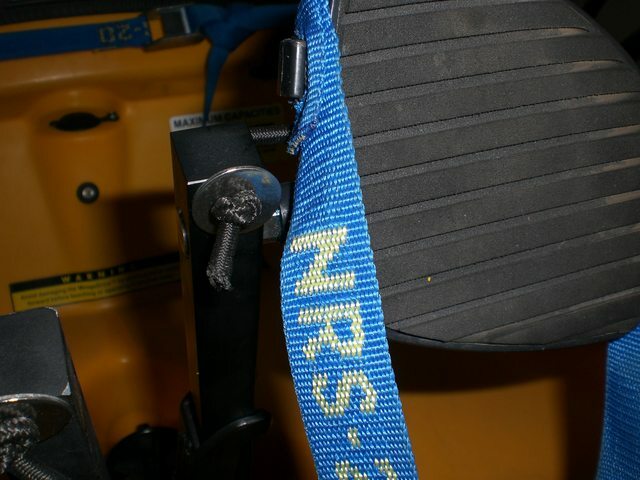 Sorry to bump up an old thread, but just bought myself a n Outback and hate the foot straps, would love to try this heel strap mod, some of the photos are missing from the original thread, just wondered if you still had them Roadrunner and if so if you would mind sharing them again? Nothing wrong with resurrecting an old thread! I still need to make mine. A back injury two years ago stopped me from pedalling. Got the all clear last week! Time to get back out on the water! I "stole shamelessly" roadrunners great idea a couple of years ago and made heel straps out of some extra 1" wide, NRS tie down strapping I had left over. I used an old soldering iron to melt the nylon strapping, to make the rectangular slots to fit the Hobie pedal tabs. I also "doubled over" the strapping as its thinner than the neoprene as you can see in the attached photo.......I love the heel straps for all the reasons mentioned above. I wear size 12 water sandals, so I simply connected the strap to the inside pedal tab, laid my shoe in the strap and formed it around the heel, to where the ball of my sandal was centered on the pedal, marked the location for the outside slot and melted the rectangular hole.....folded over the strap and melted the second outside hole......duplicated the last strap from the first one used as a model. It's easy to make and well worth the hour of labor. Wow, thanks for the mod. It was something I have been thinking about as I just bought an Oasis. And as I have a form of muscular dystrophy that affects my leg muscles and can't hold my legs up on the pedals. I have ridden my recumbent but use clip-in pedals with a corresponding cleat in the bottom of a bicycle shoe but didn't really want to do that on the water. Your solution is perfect. I'm pretty happy with the way my Crocs jam into the factory straps, and their heel strap holds my feet up nicely. But if I do make this mod, I'll use 1¼" military web belt material. It's stiff enough that it won't twist, tangle, or flop around. I'm pretty happy with the way my Crocs jam into the factory straps, and their heel strap holds my feet up nicely. If they jam TOO well, it could inhibit escaping a flipped boat a-la the picture in post 1. That picture convinced me to switch from size 13 Keens mentioned in post 5 as real "stickers" to wrestling shoes. I first was gonna point out how the Keens stick so well by jamming them in with feet canted out, then relaxing your heels down, which kind of locks them in (due to the diagonal position of Mirage toe strap). Capsize hazard! So for those not yet switching to heel straps, I observe you can avoid dropping out by slightly pointing your foot downward (sort of pointing your toes forward). Shoes that exert friction against the strap may be a false panacea due to capsize hazard. The Keens many-slotted sandal is wonderful for releasing sand, but is about the worse shoe I ever tried to swim with (weakened kick stroke to reboard boat). Also the rear strap elastic can give out when clambering up underwater rocks. Wrestling shoes ventilate, are light, swim well, and have great traction for a cement wall I have to embark on sometimes. Slippery against toe straps, so maybe switch to heel ones. Thanks for response and great detail. This is what I had in mind, you have just solidified it for me.